Some composers adored wine. Ravel chose fine wines to accompany his own dandy lifestyle. 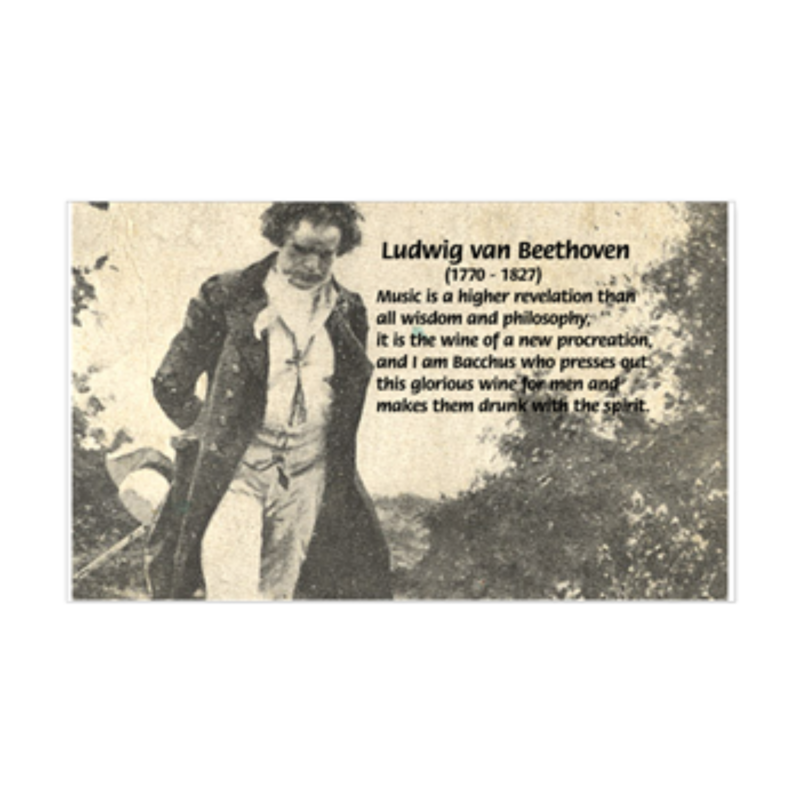 Beethoven apparently drank three bottles of Franconian wine each night. Some composers hated wine. Pierre Boulez was famously strictly against alcohol. And others composers loved wine so much it might have actually helped to inspire their work, Richard Wagner being one of them. And as Debussy modeled himself on Wagner and 2018 is the Centennial of his death, and France is the theme of this issue, and one can hardly think of France without thinking of wine, I think its honorable to pay tribute to the one French wine that Wagner loved so much he ordered 100 bottles to be sent to his home in Bayreuth. And here is where there is a convenient connection: Wagner drank his Saint Péray, a brilliant sparkling or still white wine, while he composed Parsifal, that Holy Grail of operas, a work that for many inspired Debussy’s own Pelléas et Mélisande. Et Voila! We find our French wine via a German composer who inspired French music. That gives new meaning to the phrase: à la Française, albeit with a Teutonic twist. It is understandable why the wine of Saint-Péray conquered the artistic, noble and glitterati society of Europe, though after the French Revolution it adopted a religiously neutral name: for a time Saint-Péray was known simply as “Péray white wine.” Lamartine, Daudet, Maupassant, and Baudelaire all mention the wine in their work. Even Pope Pius VII himself sang the wine’s praises. The still white has a robust and thick, buttery taste of almond and honey and creamy fruits such as a peach and apricot. It and the sparkling variety are made from the Marsenne and Roussanne grapes, which grow in a cooler, more humid climates suitable for making Burgundian style deep whites and sparkling wine. The grapes are pressed. The alcoholic fermentation takes place in vat and oak barrels at cold temperatures. The best producers such as Yves Cuilleron and Alain Voge are known for special limited wines, but the Charpoutier may be the best and most affordable and accessible. Paired with the star chef Anne Sophie Pic, the Charpoutier family has provided an excellent and affordable example of the Marsenne Saint-Péray. And for the best of the best, try Alain Voge, Le Fleur du Crussol, a top Parker Point winner and well regarded as the finest example of the wine from the region. Innovation and inspiration were at play when in 1829, Louis-Alexandre Faure, a wine maker in the appellation, inspired by the methods used in Champagne, produced the first “sparkling” Saint-Péray wine. The wine would receive official recognition in the 20th century: on 8th December 1936, Saint-Péray became one of the only 9 wines to receive AOC status. Unfortunately, today the sparkling kind has lost its glamour and is hardly distributed outside of France, though the still wine remains a favorite of collectors and connoisseurs (and composers and conductors..)… Both Debussy and Wagner have lost none of their appeal. Wagner was indeed lucky to have his Holy Grail of wine in his time. You need not wait for inspiration. Your muse à la Française is waiting. Previous PostPrevious Williams, Wine and Bernstein. John Axelrod is recognized as a leading international classical music conductor, having performed with most of the worlds best orchestras and opera houses. He is also a veteran oenophile and published author. In 2017, the well read blog has morphed into iambacchus.com, a site on which John can explore deeper his love for wine and music. and share these musical and gastronomic experiences. This commitment to classical music, wine and food has been featured in such publications as Corriere della Sera, El Mundo and Lufthansa in-Flight Magazine as well as Axelrod's own published articles in Crescendo Magazine. In 2013, Axelrod published his book, "Wie großartige Musik ensteht oder auch nicht," and recently released on an ebook about conducting the music of Leonard Bernstein. Prior to being a conductor, Axelrod was the Director of the Robert Mondavi Wine and Food Center in Costa Mesa, CA. There he became an expert on wine and food, working with celebrity chefs, preparing wine educational seminars and developing his love for food. This background, as well as his profile as a classical music conductor, writer and public artist, frequently featured in print, internet and on television inspired him to create IAMBACCHUS. John Axelrod is recognized as a leading international classical music conductor, having performed with most of the worlds best orchestras and opera houses. As a result, this lover of wine and Italian food has, during his international travels, sought out the finest wines and authentic Italian restaurants for his own enjoyment. When asked by his colleagues and friends, Axelrod enthusiastically began to share his discoveries which led him to write his reviews on his own website and begin the website AUTENTICO ITALIANO. This passion for wine and food has been featured in such publications as Corriere della Sera, El Mundo and Lufthansa in-Flight Magazine as well as Axelrod's own published articles in Crescendo Magazine. Axelrod recently published his book, "Wie großartige Musik ensteht oder auch nicht," and is writing a 2nd book about conducting the music of Leonard Bernstein. Prior to being a conductor, Axelrod was the Director of the Robert Mondavi Wine and Food Center in Costa Mesa, CA. There he became an expert on wine and food, working with celebrity chefs, preparing wine educational seminars and developing his love for food. This background, as well as his profile as a classical music conductor, writer and public artist, frequently featured in print, internet and on television uniquely prepares him to create IAMBACCHUS.